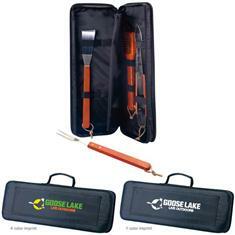 Our 5 piece Grilling set comes in a tough 210 Denier Polyester case for easy transport. The set includes a spatula, fork, tongs and a grill brush. All of the utensils are made of steel with wood handles and have a leather loop for hanging. A nice price point for Customer Appreciation gifts. Imprint Area: 10" x 3"